Rossanee Nurfarida was born in Thailand’s so-called “Deep South”. Her first collection of poetry Far Away From Our Own Homes was a Finalist for the 2016 South East Asian (SEA) Writers Award. Not only does Nurfarida’s Muslim hijab standout in Thailand, a country made up predominantly of Buddhists. Her poetry also tacks a daring course, pointing out how religion can divide the Thai state, communities, and lovers. While most Thai poets have been men employing strict rhythmic structures in their poetry, Ms. Nurfarida words express a modern woman’s perspective composed in free verse. In 2017, OXLAEY’s Ryan Anderson interviewed Nurfarida (in English) about her work and the poem, Lost in Homeland. Anderson: Why do you use a pen name, rather than your real name when writing poetry? Nurfarida: My real name is Rossanee Kaesaman. Kaesaman is my family name. Do you want to know the real story? The truth is that, when you say I’m from this family, they will know where your hometown is, who is your father, who is your mother. So I want to protect my family. My dad saw the cover and asked me, ‘why are you this name’? Anderson: Can you describe your clothes? Nurfarida: Everyday when I go out from my home, I wear this scarf. We call it a hijab. I want to show that Muslims can do everything. When I wear hijab and I work, people are amazed when I interview them They say you are a journalist in hijab. In Thai society, Muslims are like second-grade people. Islam is not a bad thing for this land or this country. I don’t know what the problem is between the religions or different way of thinking, but finally I found that they don’t understand why. Why we have to do this. Why we can’t do something. Anderson: What was going on in your life when you wrote “Lost in Homeland”? Anderson: How is your poetry different than older Thai poets? Nurfarida: The old Thai poem style, they have a rhythm. They have strict syllables. My style is free verse. There aren’t syllables or rhythms. In 2016, Rossanee and Ryan teamed up to create a video version of this poem. In the video version, Ms. Nurfarida recites her poem while stranded on an old fishing boat perched at the top of a four-story, urban house in southern Thailand. The video’s visual references to Islam extend the poem’s “lost at sea” metaphor, commenting on southern Thailand’s Muslim minority as possibly being a nation stranded in the country of their birth. LOST IN HOMELAND was a 2017 official selection at the Juteback Poetry Film Festival, the Bangkok Underground Film Festival, and the CYCLOP International Poetry Film Contest. Lost in Homeland paints the picture of an individual, alone and drifting aimlessly at sea. This image contrasts with other seafarers that Nurfarida names in the first stanza of the poem. The poet references the famous Chinese explorer Zheng He (1371 – 1433) as well as armadas in Southeast Asia led by European colonists from the 16th to the 19th centuries. The small boat imagined by the poet is, however, powerless. It floats listfully, almost aimlessly in no particular direction. It’s so far from land that no birds are seen. Even the crash of waves has seemly abandoned this boat, which doesn’t have a mast to propel itself forward. 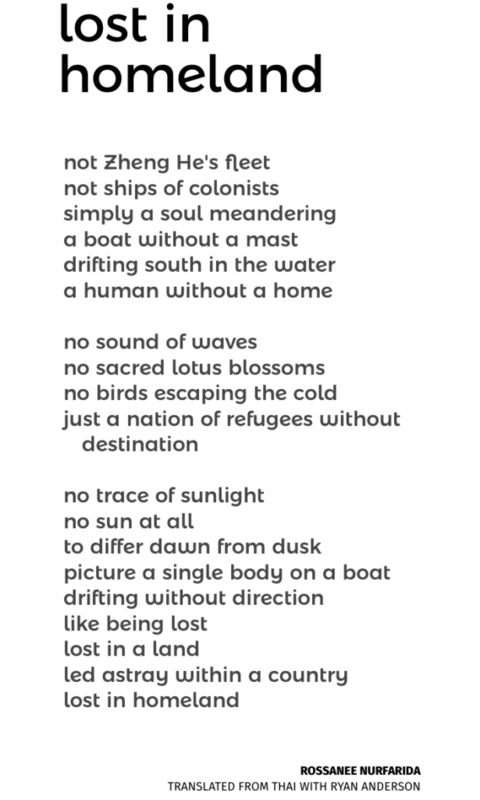 The second stanza gives a clue as to who could be on the boat, in the line “a people of refugees”. When the poem was written in 2015, thousands of Rohingya, born in Myanmar, were fleeing the land of their birth. Human smugglers had overcrowded them onto small fishing boats, without sufficient fuel or water. The boats ended up adrift in the Indian Ocean and slowly moved southward off the coast of Thailand. Amnesty International described Thai navy vessels pushing refugees’ boats farther out into international waters, rather than towing them onto shore*. Lost in Homeland is from the collection Far Away From Our Own Homes (ไกลกว่ารั้วบ้านของเรา) published by Pajonphai Publishing (Copyright 20156. Printed by permission. Suriyun Kumjang (camera), Rosmarin Onprom (production assistant), and Pichai Buranawat (boat/location) all supported the production of the original short film.